Got this letter today, and at first glance it looked fairly legit. 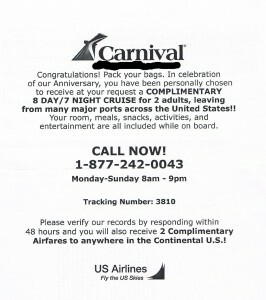 This scam company even used the Carnival Cruises and US Airlines logos. 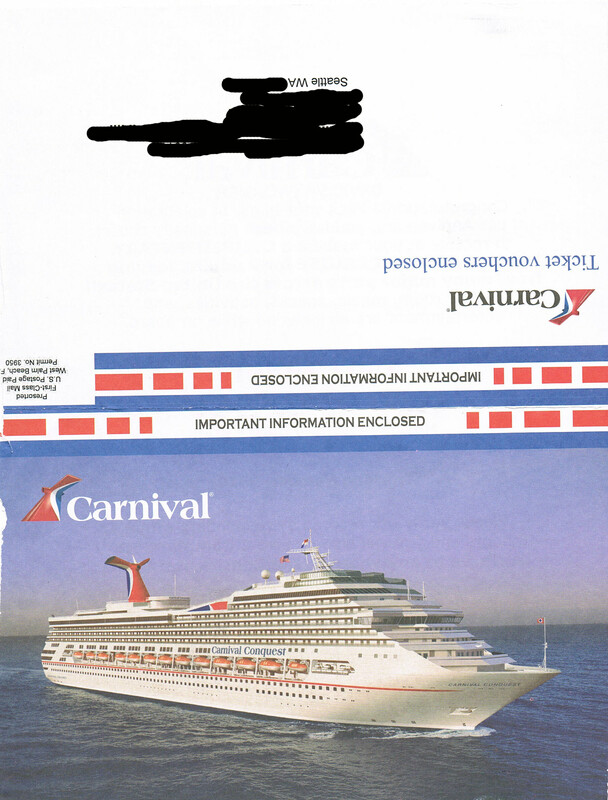 The letter claimed that I have been “personally chosen” to receive a free cruise, including airfare. Of course, this is a scam. Stay far away. When I called the number listed, 877-242-0043, there were many rings, and finally a woman answered the phone. I don’t recall her using a company name to answer the phone. Anyway, she told me that the letter I received was from a local time-share company (Tranquility Travel). She asked me about 4 or 5 questions about me to made sure I qualified, then tried to schedule an appointment for a 90 minute timeshare presentation. That’s all I needed to hear. Knowing full well that these high-pressure sales pitches are usually run by crooked companies and dishonest people, I said no thanks and hung up the phone. After doing some more research on the company responsible for this letter, Tranquility Travel, it is clear that this is all just one big rip-off. Save yourself the time and money. If you receive one of these, you’re better off shredding it. Congratulations! Pack your bags. In celebration of our Anniversary, you have been personally chosen to receive at your request a COMPLIMENTARY 8 DAY / 7 NIGHT CRUISE for 2 adults, leaving from many major ports across the United States!! Your room, meals, snacks, activities, and entertainment are all included while on board. 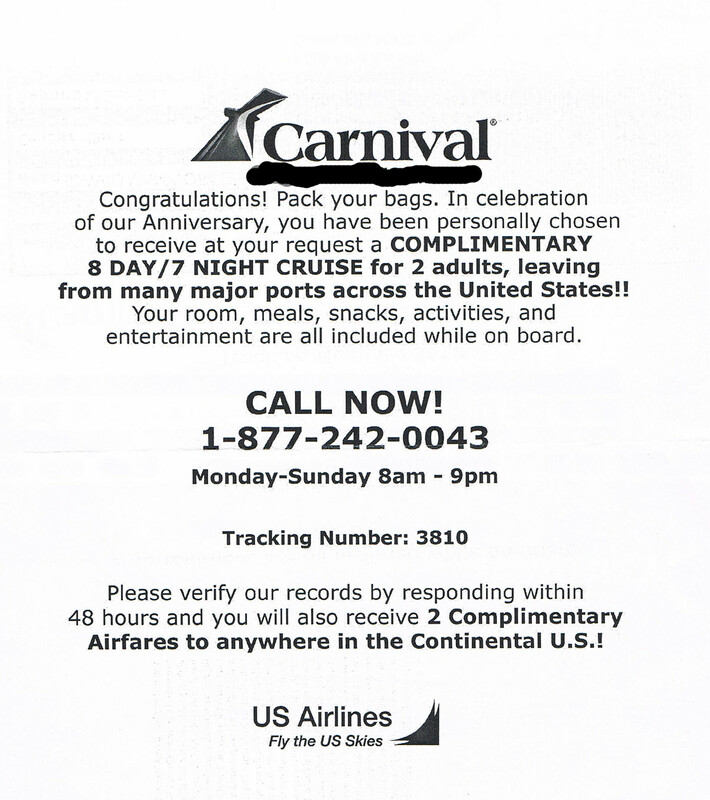 Please Verify our records by responding within 48 hours and you will also receive 2 Complimentary Airfares to anywhere in the Continental U.S.! This entry was posted in Deception, Snail-Mail Scams and tagged Carnival Cruise Scam, timshare, Tranquility Travel on October 31, 2011 by David.